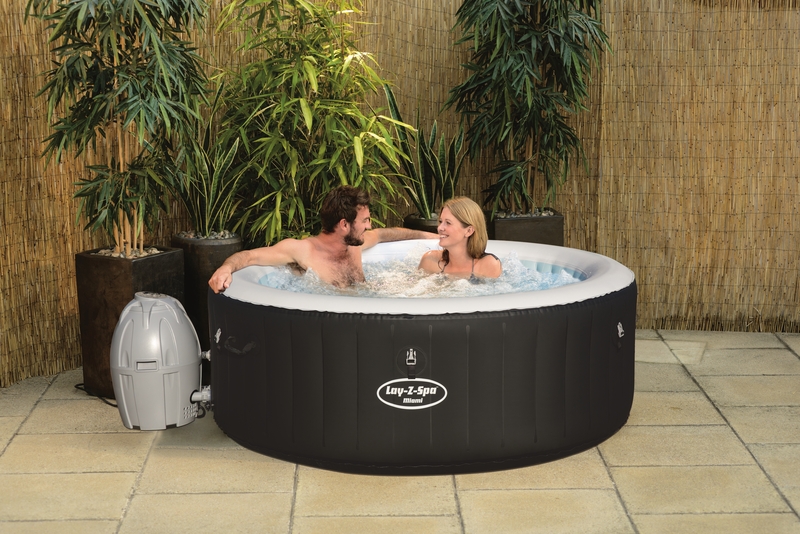 We have high-quality hot tubs on sale with Free Delivery and 1 Year’s Warranty included. We work exclusively with Lay-Z-Spa for their durability, quality and comfort. Most of these hot tubs are constructed with a durable inflatable material and use a simple and fast inflation mechanism which only takes 10 minutes to set up — so that your tub only occupies your garden space when you want to use it. Here’s a sample of three of our best deals at the moment, but be sure to view our full range of hot tubs to find the best fit for you. This is the higher end model and in terms of relaxation, it really can’t be topped. It has a max temperature of 40c, is able to hold up to six adults. 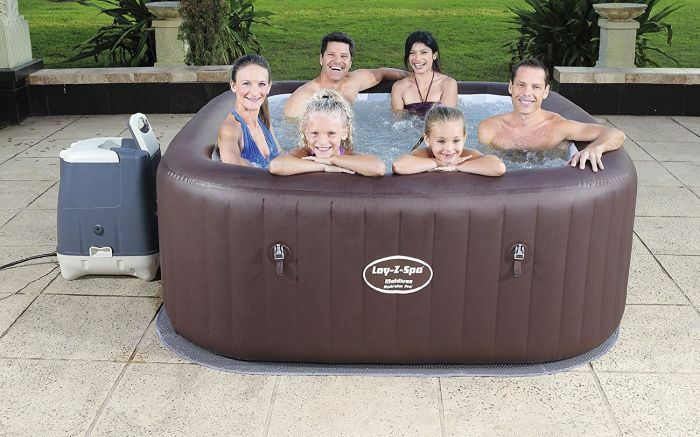 As with the other hot tubs we have on sale, this one inflates when you want to use it. It has the deluxe massage system with 8 HydroJets & 140 AirJets. The Miami comfortably seats up to 4 people and is the perfect way for couples and families to relax and unwind in 40°C water with a soothing Airjet massage jet system (it has 81 individual AirJets to ease out those tense muscles). The Miami Airjet has most of the features of our other hot tubs on sale. As with the other models, it has the advantage of portability, you really need no further excuse to enjoy the luxury of your very own spa. As with the Maldives, it has a max temperature of 40°C. It has a Rapid Heating System, and as mentioned, 81 individual Lay-Z-Spa Airjet Massagers. 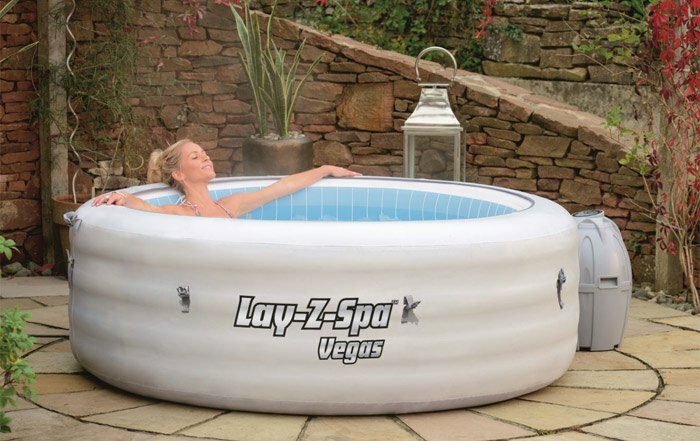 The Lay-Z Spa Vegas Pool is another compact hot tub, perfect for your garden. View the video here. It’s easily portable and comfortably seats 4 adults. Once drained it can be easily moved around or stored away. It uses a rapid heating system which warms water about 1.5-2°C degrees per hour up to a maximum of 40°C and includes simple Video instructions. It has a digital control panel so that you can make adjustments to the heat, water filtration and massage bubbles. 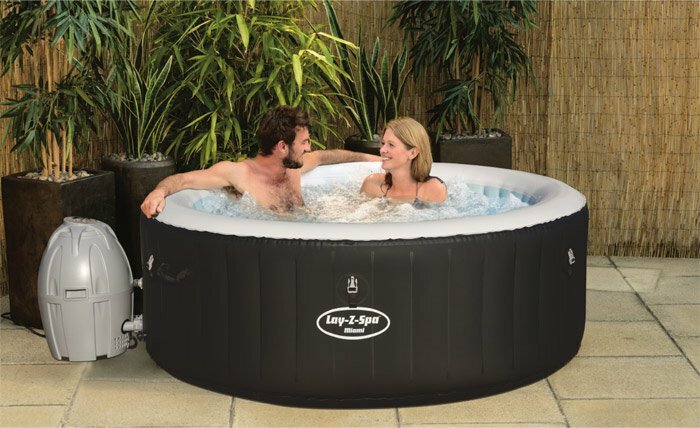 To view the rest of our hot tubs on sale, check out our full listing here.